Multiple Suicide Bombings In Afghanistan Leave Dozens Dead, Scores Wounded : The Two-Way Two coordinated suicide attacks in Kabul killed at least 25 people and wounded scores more. In a separate attack in the country's south, at least 11 children at a religious school were killed. 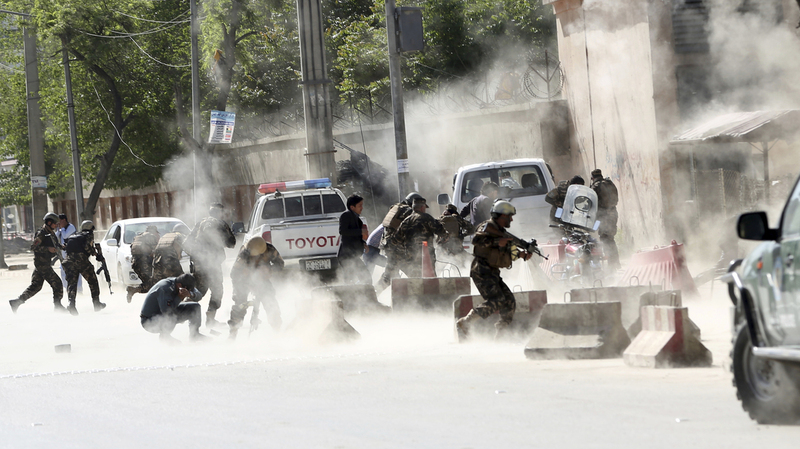 Security forces run from the site of a suicide attack after a second bombing in Kabul, Afghanistan, on Monday. In Kabul, the first explosion occurred when a suicide bomber riding a motorbike detonated outside the headquarters of Afghanistan's National Directorate of Security. When reporters rushed to the scene to cover that explosion, a second suicide bomber on foot struck, suggesting that journalists may have been among the intended targets. If so, the deaths of at least eight reporters in the twin attacks is one of the worst attacks against journalists in Afghanistan's decades-long conflict, Najib Sharifi, director of the Afghan Journalist Safety Committee, said. Kabul police spokesman Hashmat Stanekzai confirmed the casualty figures and said that four policemen were also among the dead. Islamic State claimed responsibility for the attack via its news agency. The group said it was targeting the intelligence headquarters. In Kandahar, a suicide bomber drove his explosives-laden van into a foreign-force convoy, police said, according to Reuters. The 11 children killed were students at a nearby madrassa, or religious school, says Matiullah Zhman, a spokesman for Kandahar police quoted by Reuters. There was no immediate claim of responsibility in that attack. A spokesman for Resolute Support, a NATO-led training mission for Afghan forces, says eight Romanian soldiers attached to the unit were also wounded in the attack. "Our thoughts and prayers are with those wounded, and with the innocent Afghans whose lives were needlessly taken from them by the enemies of Afghanistan," Gen. John Nicholson, Resolute Support commander, said in a statement. "In their spring offensive announcement, the Taliban claimed they would pay special attention to protecting the lives and properties of the Afghan people; however, their hypocrisy was on full display today as they viciously killed Afghan citizens, including children who were Madrassa students," he said. In the Kabul attacks, Shah Marai, a photographer for Agence France Press (AFP), was among those killed. Sharifi, the director of the journalist group, said at least seven of journalists lost their lives. Images from the scene showed men lying on the ground, their cameras flung amid pools of blood. Following the attack, colleagues of the slain and wounded reporters posted images of their friends on social media. "I was at the hospital where the dead bodies of at least four journalists were kept – a large group of journalists [gathered] there to mourn," said Sharifi. "Everybody was heart broken, everybody was crying, everybody was sharing tears." Another Afghan journalist, Anees Ur Rehman, said he was speechless. "Sorry, I don't have any words to express my feelings," he said. Journalists in Afghanistan, he said, were "family." Ur Rehman said other reporters on the scene described the second bomber as being disguised as a journalist. "They adopt behaviour of journalist," he said. He said his friends – fellow reporters – told him the explosives were concealed inside a video camera. "This is a very big threat," he said. They are adopting "new things" – new methods — of killing people, he said. Sharifi said he had heard a similar claim, but could not confirm it. Afghanistan is one of the world's deadliest countries for journalists – but it also enjoys a vibrant, critical press. Sharifi described Afghanistan's press freedom as "one of the biggest achievements of the government." "It will definitely [meant to] push them away from covering such incidents, and [to] compel journalists to stop practicing journalism," he said. "I really admire the courage," he said. "Despite all odds they have continued following this difficult journey." Earlier this month, a suicide bombing at a voter registration center in Kabul killed more than 50 people.